It was a solemn day to say goodbye to Nathan Drake when the finale to his story launched last year. Uncharted 4 landed as one of my favorite games of all time, a stunning culmination of the entire Uncharted series, which I also applauded. We all knew some form of a story expansion was coming before Uncharted 4 even released, but speculation was wild for who’s story it would tell. Would we follow Sam, Nate’s brother? What about the exploits of a younger Sully? 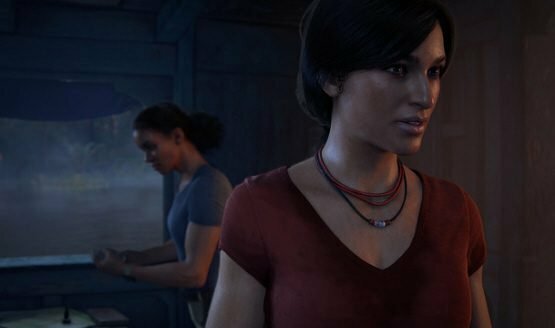 Color everyone surprised when the reveal of Uncharted: The Lost Legacy at PSX 2016 put Chloe and Nadine together center stage, two criminally under explored characters from Uncharted 2 and Uncharted 4 respectively. Our hands-off demonstration began in a way familiar to most Uncharted fans. Chloe and Nadine are making their way through a lush green locale, scrambling up sheer cliffs and generally looking for any hints of ancient lost civilizations. The dynamics between Chloe and Nadine seem similar to Nate and Sam in Uncharted 4, but Naughty Dog hinted that the narrative would be even more woven into the action and gameplay than we’ve seen before. For example, the player character is Chloe, but if Nadine is mad, her AI may reflect that in the way that the gun combat segments play out, so you won’t always be able to rely on the AI cooperation in the same way throughout the game. The banter between these two both in traversal and battle really helps to make the game world feel alive, like you are actually on a treasure hunt with a good friend. If you find yourself worrying about veering from Drake’s story, fear not. Uncharted: The Lost Legacy is definitively Uncharted. From the way Chloe scrambles around the environment, to the huge bombastic set pieces, and even to how Chloe’s mean right hook looks as she slugs some poor gun-for-hire right across his jaw, these girls are tough and can more than fill the shoes left behind by our favorite treasure hunting half-tuck. In fact, it’s kind of refreshing to see this world through a different set of eyes. It wouldn’t be Uncharted with collapsing structures and plenty of enemies to shoot, and The Lost Legacy deals a great hand delivering this extreme set pieces and keeping the player guessing as to what might happen next. Gunplay appears to hold the same basic formula that it has for four games. While I’m sure there are subtle aspects that have been improved and iterated on, it was impossible to tell how different it might feel without the ability to get our hands on the controller. While the portion we were shown didn’t showcase a set piece that I would call iconic (like the train in Uncharted 2, or the plane in Uncharted 4) or an environment all that different from previous Uncharted titles, it showed off plenty of surprising moments I didn’t see coming, most notably the armored vehicle that bursts through the wall Chloe is actively climbing near the end. It seems that Chloe will find herself facing many of the same near-death types of situations that Nate so famously got himself into and subsequently out of. The end of the trailer also gave us a good look at Uncharted: The Lost Legacy’s villain, another recognizable evil at clear odds with our main character. The new baddie seems to have a certain level of calculation and cunning, making him a more sophisticated entity than any other Uncharted has had. He’s already earned a place as a villain that I really, really hate in the best of ways, which is what Uncharted games have always done well. They make these characters have so much soul that even the evil ones pop off the screen and come to life, making you reconcile your elation at the character depth with the fact that you just want to give them a classic Nathan Drake leaping right hook to knock that stupid smile off their face as they walk off with your treasure. From the moment the first Uncharted released, Naughty Dog captured a certain magic that has only ever reignited in other Uncharted games. I’m personally not ready to put my treasure hunting days behind me, and Uncharted: The Lost Legacy looks to be the perfect new Uncharted game in spite of Uncharted 4 being the end of Drake’s journey. Replacing a beloved main character that’s had a place in our hearts for nearly a decade is a monumental task bigger than an Uncharted set piece, but Chloe is more than capable of taking on the lead role in this expansion turned full release while still calling it an Uncharted game. Hands-off gameplay preview session shown running on PS4 Pro.